Actually, you need not worry - the health and vigor of the leaves look very good, as does the overall tree. 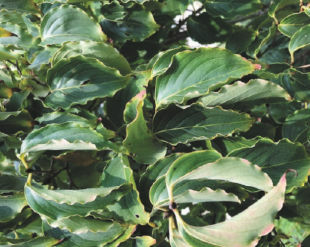 Your dogwood's growth pattern with the drooping leaves with curled edges is normal. Some Kousa's droop and curl more than others, it depends on the cultivar. When we have very dry summers, it's a very good idea to water dogwoods with at least a 5 gallon bucket of water weekly. Make sure there is 1-3" mulch over the roots to keep the soil cool, moist and the weeds out. Remember - do not put the mulch next to the trunk of the tree. Young Kousa and Flowering Dogwoods take a while to get established. Each spring the tree should have more flowers than the previous year. Fertilize with an organic, slow release fertilizer such as Flowertone by Epsoma in the early spring which will help the tree to produce flowers. Compost and/or leaf litter compost will also help to give nutrients to the tree.